Former warlord Jean-Pierre Bemba lodged an appeal with the Democratic Republic of Congo's top court on Monday after he was banned from running in upcoming presidential elections. Bemba and five other candidates, including three former prime ministers, were barred by the National Independent Electoral Commission (CENI) late Friday. The move sent shock waves through the country's volatile politics ahead of the twice-delayed elections, triggering angry accusations of a fix. But by Monday night four of the six banned candidates had taken their case to the Constitutional Court, the highest in the land. The other two were expected to follow by Tuesday. A major rival to President Joseph Kabila, Bemba returned to the DRC on August 1 to file his candidacy after he was acquitted by the International Criminal Court (ICC) in the Hague on war crimes charges. But he remains convicted by the ICC for bribing witnesses -- a crime for which he was handed a year-long prison term and a 300,000-euro ($350,000) fine. It was this conviction that CENI invoked as a reason to bar him from the December 23 vote. 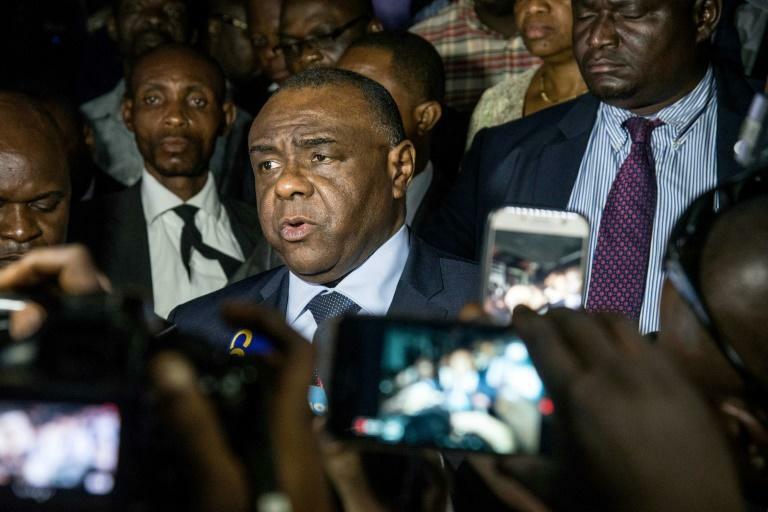 Bemba -- who once headed a powerful militia since transformed into a political party, the Movement for the Liberation of the Congo (MLC) -- indicated he would take the legal route to contesting the election. "Let's see what happens at the Constitutional Court, as long as the court is independent," he told France 24 television before an AFP correspondent watched his supporters arrive at court to file the appeal. Pro-democracy campaign group Lucha mocked the chances of success, branding the Constitutional Court as stacked with Kabila loyalists. "The Constitutional Court's verdict is known in advance," it said on Twitter. Three of Kabila's former prime ministers -- Samy Badibanga, Adolphe Muzito and Antoine Gizenga -- were also banned from running, as was the sole woman candidate, Marie-Josee Ifoku Mputa. Gizenga, a 92-year-old figure from the time of the DRC's independence from Belgium in 1960, was ruled out on the grounds that he had not signed the candidacy forms. Muzito was excluded because he was a dissident member of a party, Palu, which contested that he was its candidate. Badibanga and Ifoko Mputa were banned because they had acquired foreign nationality -- dual citizenship is illegal under DRC law. The electoral commission accepted 19 candidates out of a total of 25. In a statement signed by Bemba and exiled politicians Moise Katumbi and Felix Tshisekedi, opposition groups urged Kabila to free up the electoral process and "stop giving directives to the election commission". Government spokesman Lambert Mende dismissed any idea of interference, saying that "legal norms" determined CENI's decisions. A country of some 80 million people, DR Congo has never known a peaceful transition of power since gaining independence in 1960. A long tradition of coups and wars has stirred fears of a return to war if the December vote goes awry. Kabila, 47, has held office since 2001, taking over from his father, Laurent-Desire Kabila, who was assassinated by a bodyguard. He has stayed in office since reaching the end of his two-term limit in December 2016 thanks to a caretaker clause in the constitution. He kept the country in suspense for months over his political plans, ending the uncertainty on August 8 by saying he would not run again. Kabila has thrown his support behind close ally Emmanuel Ramazani Shadary, a former interior minister and loyalist -- a move that has stoked accusations that he wants to remain the power behind the throne. The United States meanwhile voiced regret Monday that the DRC had spurned UN logistical support for the elections while South Africa said Kabila had rejected an offer to send in former president Thabo Mbeki as a special envoy.